You can find the complete explanation of Oscar’s project on his website. Note that this is a multi-lingual post. This entry was posted on Sunday, January 22nd, 2012 at 7:09 am	and is filed under how-to, Interface, robotics, sensors, techniques. You can follow any responses to this entry through the RSS 2.0 feed. You can skip to the end and leave a response. Pinging is currently not allowed. With binary weighting, this could almost correlate each input pin with a bit in the A/D result, although it would probably require 10-bit A/D and some smart quantization. if all you want is a binary value then why not attach these 8 sensors to a 74HC165N or similar and then read the incoming byte? 00010000 will mean sensor 4 crossed the line. A/D needs only 1 pin, the 74HC165N needs at least 2 for clock and data. In that respect, this idea can prove useful. However, if you read the entire web site he suggests using the ADC0831 and in that case you’re absolutely right, Mike. There’s no point in using this hack when you’re adding an external chip that requires a couple of pins to interface. It makes way more sense to add a parallel input shift register instead of dealing with fuzzy resistor values. 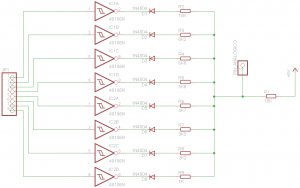 Having to use I2C (2 pin) or SPI (4 pin) and we are losing the advantage of handling a single pin, in addition to communications that these buses have to send and receive commands and data, so you get the status of sensors is not so straightforward. However, the I2C is a good option for when you have an analog pin as it would be fast enough to not take a PID control and would use only 2 pins. I guess I’ve been looking at i2c chip data sheets so much lately, I can’t imagine anything without that bus in use.